Green Smoothie. Easy to make! “Have you ever had a green smoothie?” I could’ve asked numerous folks in the audience that day, in fact anyone who was laughing at the actress who had just walked on stage with a kale smoothie, a prop to emphasize how differnt she was from “normal”. It wasn’t that funny to me. I thought the girl was smart to choose a kale smoothie over a chocolate milkshake. She was only playing a nerdy character but the truth is a green smoothie, when done right, has it all over a milkshake of any flavor. First, you will need a blender. The base ingredient is a banana. Bananas make the smoothie sweet and thicken it. If you want your smoothie on the creamy side, the next ingredient is almond milk (or any nut milk). If you like it juicy rather than milky, add coconut water or throw in juicy fruits like oranges or watermelon and add a little water. Next, add some more fruit. Whatever you like, to give it a new taste. I like berries in mine. Some berries can make your green smoothie brown, so add a teaspoon of Matcha powder if you want a really green one. Next, give your smoothie some added nutrients with a tablespoon or more of flaxseed. Add a nut butter (tahini and cashew are great) for protein and healthy fats if you are going for a creamy smoothie. Last, throw in the greens. Kale is terrific but it is kind of tough and unless you have a super-speedy mixer like a Vitamix, you are going to get little kale pieces in your smoothie–not a bad thing really. I prefer swiss chard or spinach, or even a handful of mixed greens in mine. Anything will do though, even romaine. Blend it all together. I like to add a piece of ginger, some turmeric, and a few dashes of pepper for added antioxidant power. Now, drink it! It is delicious and way better for your health than a milkshake. Here’s why. Bananas have potassium, berries are loaded with antioxidants, flaxseed contains magnesium, and almond milk has more calcium than milk. (Don’t shy away from these nut milks thinking they are only substitutes for the real thing: milk. Not true!) And the green stuff, most of them score 1000 points on the ANDI nutrient scale, the highest score a food can receive for nutrient content. 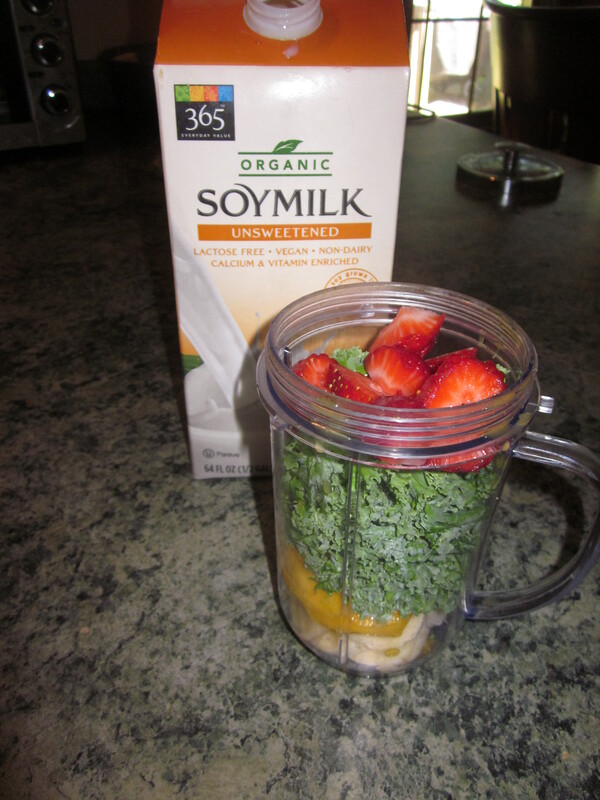 Blending food like this helps your body get more nutrients. A smoothie is a meal, especially the creamy ones with the nut butters in them. If you want it as a dessert, using less almond milk and frozen fruit will render something more solid and cold like ice cream. The best part of a green smoothie is after you eat one. There’s no holding your stomach with that uncomfortably full feeling. Instead, it energizes you. Your body jumps for joy and you are ready to tackle the day. Fatty cream from a fatty cow is not going to make anyone feel good except a calf. Now energize your spirit. Take a minute to thank God for the bounty of food He provides. Forgo that cut of red meat and if you miss the taste of it, eat it only occasionally or use only a small portion for the flavor. Enjoy the many types of beans and whole grains God gives to us. Don’t settle for milk and sugar, look to His grand variety of fruit and nut milks. Make your main dish at every meal a vegetable dish. The abundance of greens and other vegetables is a testimony to the love God has for us. Enjoy eating healthfully and don’t let anyone who laughs at your green smoothie put you off. You are the smart one, my friend, you have chosen the better way. Look to your Bible to fill your hunger for spiritual contentment. Savor God’s great promises and the beauty and depth of His love for you that is written in the words of the New Testament and in the Psalms. So many things in this world fill our thoughts with anger, fear, and despair but these are not from God. We rush around checking off the tasks on our list. We imagine awful scenarios and bring ourselves to a point of anxiousness and hopelessness that makes God weep. Much of the sickness, poverty, war, violence and hatred of this world are of our own making; they are not the promises of God. Choose a better way by spending time contemplating God’s words to us because even with these difficulties that abound around us, God is able to reach out and calm our spirit with His excellent love. And lastly, choose the hope for a better life provided by Christ since He is the greatest of God’s gifts to mankind.